It remains unclear how the success of an ambitious goal to improve water efficiency and reduce water scarcity will be measured. 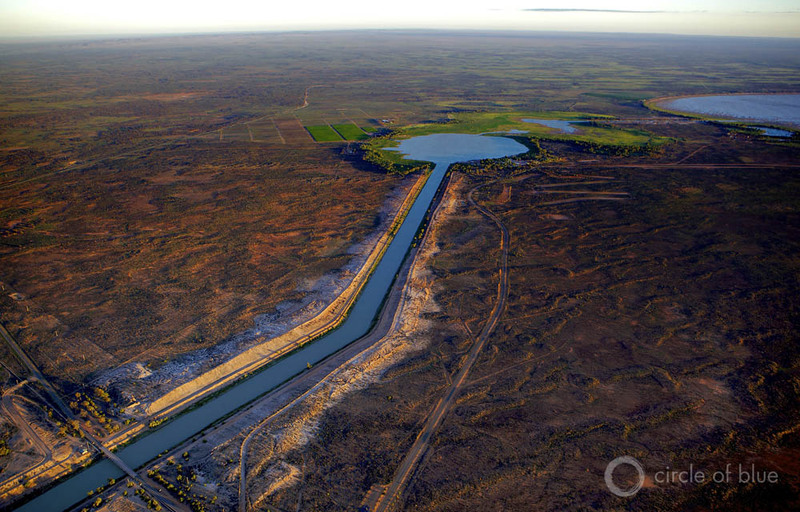 The threat of water scarcity is always present in places like Australia’s Murray-Darling River Basin. A severe drought there in the early 2000s decimated the rice industry and prompted a major overhaul of the region’s water rights system. Click image to enlarge. On September 25, 2015, the global development agenda for the next 15 years was set at the United Nations General Assembly following the adoption of the Sustainable Development Goals (SDGs). The inclusion of a stand-alone and integrated water goal (SDG 6) that moves beyond its predecessor (i.e. Millennium Development Goal 7: halving the amount of people without access to safe drinking water and sanitation), has been well received by the global water community as is clear from Expert Commentary on the positive implications of the various water sub-goals of SDG 6. It remains unclear, however, how the success of these goals will be measured. Over 300 SDG indicators were originally proposed but were subsequently reduced to 69 indicators followed by a review by the United Nations Statistical Commission’s Inter-agency and Expert Group on SDG Indicators (IAEG-SDGs) on August 11. SDG 6.4 aims to “substantially increase water-use efficiency across all sectors and ensure sustainable withdrawals and supply of freshwater to address water scarcity and substantially reduce the number of people suffering from water scarcity”, but does not specifically define how it will measure water scarcity. Water scarcity is considered the current biggest threat to global prosperity, and whereas the issue can be simply conceptualized as a lack of available water relative to demand, more than 150 metrics of water scarcity exist (Vorosmarty et al., 2005). Two dominant approaches to the measurement of water scarcity have emerged over the last few decades and also form the basis of more recent, holistic multi-component metrics. The first approach holds that water scarcity occurs when annual water availability per capita is below 1,000 cubic meters per capita per year (Falkenmark, 1986) whereas the second contends that conditions of water scarcity occur when the ratio of annual freshwater withdrawal to availability (wta) exceeds a ratio of 0.4 (Alcamo et al., 2003). Common to both approaches is the characterization of freshwater resources from observations and simulations of Mean Annual River Runoff (MARR). Use of MARR to define freshwater resources supposes that it adequately represents renewable blue water resources (i.e. difference between mean precipitation and actual evapotranspiration). Under this assumption of stationarity (i.e. steady-state conditions), changes in terrestrial water storage are considered negligible (Taylor, 2009); the validity of this assumption has been challenged (Milly et al., 2008) and is questioned by recent reports of global-scale depletion of groundwater resources (Richey et al., 2015). Use of MARR specifically masks temporal variability in water resources as it does not represent the proportions of river flow that derive from steady baseflow (commonly groundwater discharges) and episodically from stormflow; such temporal variability can be substantial in semi-arid regions where efforts to reduce water scarcity may be most challenging (Jimenez et al., 2014). MARR naturally does not reflect water stored in soil (i.e. green water resources). Finally MARR does not consider the availability of natural (e.g. subsurface storage) or constructed (e.g. dams, rainwater harvesting) basin storage, both of which are central to adaptive responses to water scarcity. There is consequently much reason for concern should an indicator based on MARR be adopted to measure SDG 6.4. So, what do the United Nations Statistical Commission’s Inter-agency and Expert Group on SDG Indicators (IAEG-SDGs) propose? The IAEG-SDGs currently propose that the indicator for SDG 6.4. on water scarcity be measured as “the percentage of total available water resources used, taking environmental water requirements into account” which is defined as the “the ratio between total water withdrawals (use) by all sectors and available water resources, taking environmental water requirements (EWR) into account.”. It has been proposed to classify three levels of water stress (low, high, and very high) using the ratio of 40 percent as an indication of water stress. The proposed indicator for SDG 6.4. thereby adopts the wta ratio approach but pays a special attention to environmental water requirements. The FAO’s stand-alone inputs on the scarcity component on the proposed indicator for SDG 6.4 notes that it has the ability to provide a good indication of the pressures put on limited resources, but recognizes that it fails to pick up on a number of the key issues similar to those identified above including the inability to account for seasonal variability; adaptive and behavioral changes in water use; the contribution of fossil groundwater; and the lack of a universal consensus on the thresholds to eventually dictate the level of scarcity. SDG 6.4 would appear to be more concerned with achieving water use efficiency across multiple sectors and use this as a means of reducing levels of water scarcity, than to properly addressing what constitutes water scarce conditions. During the last consultation between IAEG-SDGs and Member States, the issue of clearly differentiating between water withdrawals and consumptive water uses appeared to be of most concern to all stakeholders. Notwithstanding the necessity of defining these terms, the global water community still remains to properly consider the fact that the proposed indicator remains dependent on observations and simulations of MARR, the implications being that not only are human adaptive responses such as the primary idea of increasing water use efficiency, adequately addressed, but neither is improved storage or any of the other identified short-comings associated with the continued dependency on MARR for deriving water availability. So, while the adoption of the goals and targets have been rightfully celebrated throughout the water community, the major challenge now is to address the shortcomings of SDG indicator 6.4. This undertaking will require a much more targeted effort, with the second meeting of the IAEG-SDGs concluding October 28, 2015, in Bangkok. Simon Damkjaer is a Ph.D. Candidate at the UCL Institute for Sustainable Resources (UCL-ISR) focusing on Freshwater Resources. Richard Taylor is a professor of hydrogeology in the UCL Department of Geography. Alcamo, J., Döll, P., Henrichs, T., Kaspar, F., Lehner, B., Rösch, T., & Siebert, S. (2003). Global estimates of water withdrawals and availability under current and future “business-as-usual” conditions. Hydrological Sciences Journal, 48, 3, 339–348. Falkenmark, B. Y. M. (1986). Fresh Water-Time For A Modified Approach, Ambio, 15, 4, 192–200. Jiménez Cisneros, B.E., Oki, T., Arnell, N.W., Benito, G., Cogley, J.G., Döll, P., Jiang, T., and Mwakalila, S.S. (2014) Freshwater resources in Climate Change 2014: Impacts, Adaptation, and Vulnerability. Part A: Global and Sectoral Aspects. Contribution of Working Group II to the Fifth Assessment Report of the Intergovernmental Panel on Climate Change [Field, C.B., Barros, V.R., Dokken, D.J., Mach, K.J., Mastrandrea, M.D., Bilir, T.E., Chatterjee, M., Ebi, K.L., Estrada, Y.O., Genova, R.C., Girma, B., Kissel, E.S., Levy, A.N., MacCracken, S., Mastrandrea, P.R., and White, L.L. (eds.)]. Cambridge University Press, Cambridge, United Kingdom and New York, NY, USA, 1132 pp. Milly, P., Betancourt, J., Falkenmark, M., Lettenmaier, D. P., Stouffer, R. J., Hirsch, R. M., & Stouffer, R. J. (2008). Stationarity Is Dead: Whither Water Management? Science, 319, 573–574. Richey, A.S., Thomas, B.F., Lo, M., Famiglietti, J.S., Swenson, S., & Rodell, M. (2015) Uncertainty in global groundwater storage estimates in a Total Groundwater Stress Framework, Water Resources Research, 51, 7, 5198 – 5216. Taylor, R. (2009). Rethinking Water Scarcity: The Role of Storage, EOS, 90, 28, 237. Vörösmarty, C. J., Douglas, E. M., Green, P. A., Revenga, C., Vorosmarty, C. J., Douglas, E. M., & Revenga, C. (2005). Geospatial indicators of emerging water stress: an application to Africa. Ambio, 34, 3, 230–6.